We believe that a cookbook is not just a bunch of recipes, but a cultural document. American popular culture is ripe with references to the work of Shakespeare, in fact, about every 20 years, there is some sort of remake of Romeo and Juliet with the era's leading heartthrob. As much as we know of Shakespeare and his work, the references to food and drink in his work are often lost as many of the recipes of the Elizabethan era are lost to most readers. 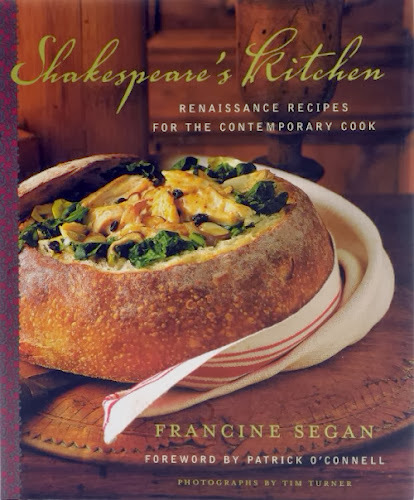 Francine Segan's Shakespeare 's Kitchen gives the reader of Shakespeare and cookbooks a chance to delve into the foods that would have been common to the Elizabethan audience. Now they are common to today's viewer. Segan draws upon texts from the late 1500's and 1600's, wading through the creative spellings and unusual customs to present recipes that transcend history. This recipe is a favorite of King James, famous for his Bible. The original recipe comes from Mistress Sarah Longe. Longe collected her recipes into a personal collection around 1610. The book now resides in the Folger Shakespeare Library. Of course, the "electric" mixer of Shakespeare's day was some kitchen help with a big wooden spoon! Put a toast in 't. To soften the blow of bitter drinks, a piece of toast was added to mellow the flavor. This is the origin of the tradition of making a toast. So here is a toast to Shakespeare's Kitchen.